He came up with this comment at the noon briefing in reply to a question on Prime Minister Sheikh Hasina’s comment on BNP Chief at a recent briefing. At the briefing Hasina said international community is not concerned over BNP Chairperson’s arrest. 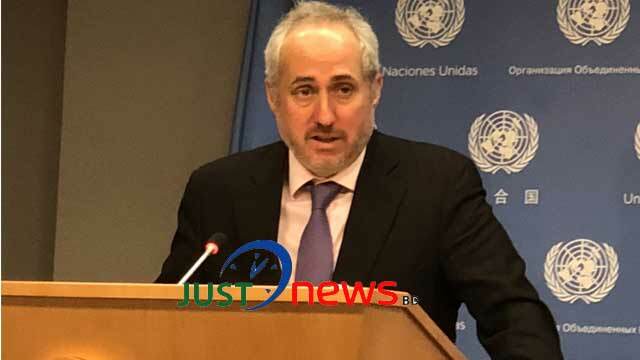 The noon brief held at the UN headquarter on Monday. At the briefing Bangladeshi journalist M Mushfiqul Fazal asked- As you know, main opposition leader of Bangladesh is in jail more than two weeks and… the reason I am asking, the ruling Prime Minister of Bangladesh, Sheikh Hasina, last week has said in a press conference that international community is not telling anything about the BNP Chief's… Khaleda Zia's imprisonment, and they are… were moving forward to one‑sided poll, which was like 5 January 2014, there was a one‑sided poll. So, my question is, what action has been taken from the Secretary‑General to hold a free, fair and inclusive election which is…?